It was the Purple Queen with its tiny lavender blooms on the back porch that caught my attention through the kitchen window this afternoon. We had a good amount of rainfall at the end of last week. It never fails to take me by surprise at how ordinary standards in my garden perk up a few days after a good heavenly shower. The Purple Queen was especially bright today with new blooms covering its trailing stems. 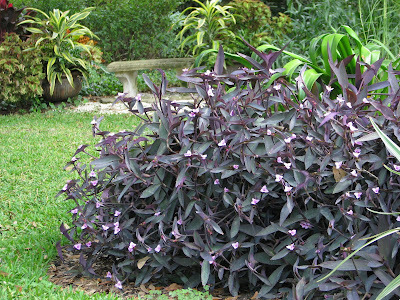 The purple foliage of this trailing plant cannot be taken for granted even though it is common and super-easy to grow and propogate. So striking is it that I use it in more than one place in the garden. It can be seen in several potted arrangements as well as easily billowing over the manmade short wall (above) in the back garden. Another straight shot view from the kitchen window. I didn't think I was going to have time to participate in Carol's Garden Bloggers Bloom Day today. 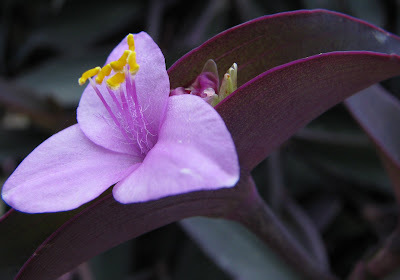 But once I got outdoors with my camera to try to capture the vivid deep purple plant I noticed a few other blooms also spurred on by the all day rainfall last week. So here are a few more blooms I managed to photograph in the span of 5 minutes while my little toddler charge was strapped into his booster chair and eating his lunch safe and sound back inside. Drangon Wing Begonia. 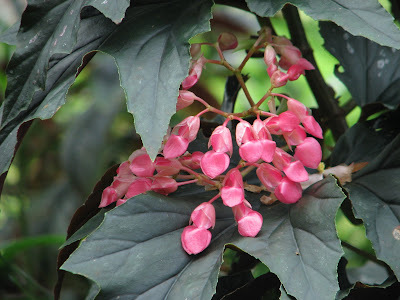 I'm always lauding the praises of Angel Wing begonia but I adore the deeply hued leaves of the Dragon Wing as well. Its very large leaves and year round lushness make up for its less than profuse blooming habits. Here it is planted directly in the ground and growing three feet tall and just as wide. 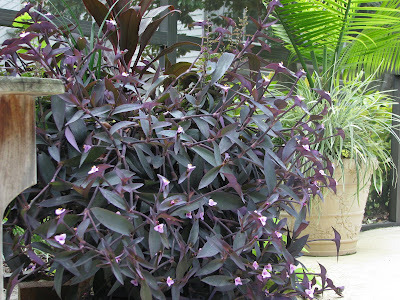 Marble leaf plant flushed out its lavender blooms both in the containers and the ground covers after the rain. 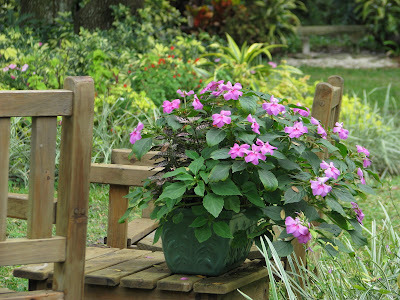 Impatiens all over the garden are making a huge comeback with the cool weather. The colors are deeper and the flowers are more abundant. They really love our Florida winters. Salvia, I'm pretty sure it is just called Red Salvia. I don't think there's ever been a whole year go by that I don't have this vibrant red flower in my garden. Sometimes in mass plantings and sometimes in a few pots like the ones here I can see out of my kitchen window. It is a good time of year for red flowers. Of course, red is my favorite color. Your garden is lovely, as always! I love that Dragon Wing Begonia but actually can't pick a favorite. That's it. I'm moving. All my plants are frozen. Leslie, Thank you. The Dragon Wing has really amazed me this past year. It was a container plant for a while and when i wanted to put something else in that container I planted the begonia in the ground. In December last year. It has been a stand out ever since. One of those plants you wonder how you ever got along without. Debbi, You are too funny. Meems, so glad you took time to take pictures of your bloomers. They look lovely to a winter weary northrener. (I know it's still early in the winter and I'm whinning already:})The purple queen is outstanding! As are your salvias. You have such a green thumb! Stunning display again Meems. When those few hard freezes came through here, it wiped out the majority of my flowers. Apparently the pineapple sage hasn't been bothered by it. First year with it and propagated one into three, well actually 5, gave two away, I am really liking her. Glad you participated, love to see your gardens. The African Iris is amazing - never seen one before - looks like a cross between a parrot tulip & siberian iris. So many plants...so little time. I just can't believe your universe! So many flowers in bloom in December. Am I going to turn into a snowbird? With your photos, it's possible. PS Your Best Performers idea and story was so much fun. I've moved the action figures to below the post on my blog in case there are any other award ceremonies to add to the list. Everytime I visit your blog I feel spring is just outside the window. Then what a disappointment when I look out there and all I see is brown. Thanks for sharing your beauties with us Meems. I've seen your Purple Queen before, Meems, but I don't remember ever seeing it bloom before--such lovely, dainty flowers! I'm with Aunt Debbi--everything is frozen here. I think we were all too busy to really post much this Bloom Day, but thanks for showing us all that is blooming in your garden--it makes me long for spring! You have a lush, little paradise there. 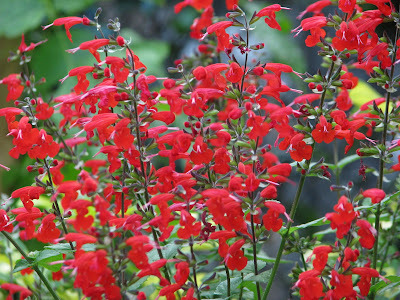 The red salvia is just perfect for this time of year. That iris is an absolute show-stopper! Meems, as usual, your plants all look so perfect!! GOOD NEWS! I just booked my ticket to Florida for the second week of February. I hope you'll be around then! I won't have a car, so I'll have to talk my aunt into coming with me or letting me use her car, but she enjoys gardens, so I imagine she'll want to come, too. How far are you from Bradenton? Thank you, your kind words, Beckie, are much appreciated. Although the garden is weary from the summer months the weather now (barring a frost)is just perfect for keeping everything sort of status quo.This time of year gardening is so much easier than any other time. I absolutely must find out if I can add that pineapple sage to my garden, Darla. It is just beautiful and what more could you ask of a perennial than to last through the freezes AND to be RED too? I'm not familiar with the comparisons you mentioned, Barbara but they sound glorious. You've got my curiosity up - I'll have to do some research. I don't know about snowbird but maybe just a winter vacation, Cameron? I will work on creating a link to the "Best Performers" on my side bar in case anyone wants to join in after GBBD is over. I've still got my little one today so any thing that gets done, gets done in between toddler stuff. :-)We are heading outside to play some tee-ball right now. Fun stuff. The purple queen almost always has "some" blooms on it, Rose but with this mild weather and a day of rain it is pretty much covered with its delicate-appearing flowers. It is actually one of the strongest perennials in my garden. Not much fazes it... even lack of water! 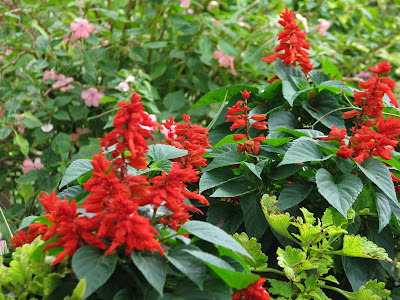 The red salvia makes a brilliant sun catcher and gleems in the midst of the garden this time of year,W2W. The red is extremely showy right now. 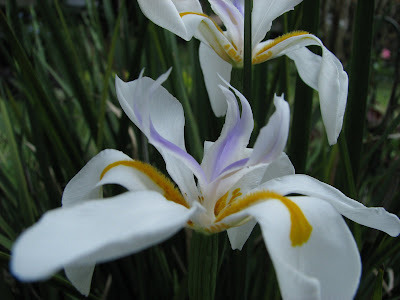 This time of year the African Iris only blooms occasionally, Marnie, the rain spurring a flush of about a dozen blooms. But in the spring it will be covered with those unique white flowers. 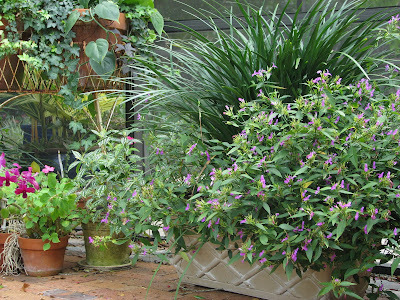 It is another easy to grow evergreen I couldn't be without in my humid-loving garden. Now that's exciting news, Kylee. You will love being in Bradenton that time of year. Last year we were on the beach at Anna Maria Island the second week of February. So beautiful. We are working on a February mini-vacation somewhere but not sure the dates yet. I surely hope I am here when you are. Absolutely, bring your aunt. February is typically our coldest month so the garden by then is in its most weary state but we will make the most of a garden visit anyway. Over the Bay and a couple of bridges you will be about 1.5 hrs away at most. I'm so happy to know you are coming for certain. Could you e-mail to me your exact dates so if I can possibly keep the dates open I will? Great plants! The african Iris is a royal beauty. It is hard to imagine the lushness of your garden, when we are buried under several inches of snow here. Meems...Your garden is lovely as always. I saw the write-up on your garden blog and garden in the Trib this past weekend, and I wanted to say "congrats!" It was a nice article and I was delighted to see you and your garden featured. They made a great choice. I'm so glad you decided to post for GBBD, I really needed it. It's finally made it above zero this morning & I don't have any blooms at all. I just love your 'Purple Queen.' I've grown something like it as an annual several years ago. I think I should get one next summer and take lots of cuttings. 'Dragon Wing' Begonia is my kind of plant. I'm drawn to those dark leafed things with bright pink flowers. Hi Meems, even the most common plants look so exotic in your garden. Honestly, I've never seen Purple Queen as pretty as the one in your photo. Pleasure to all the blooms as well. oooooh, I like The Purple Queen, and think that would make an excellent blogger name!!! Beautiful blooms as usual, Meems! wonderful to have so many things blooming in your lovely garden. i love the puple blooms on the purple foliage. here things are a little bleak. if they haven't gotten frozen by now they are drowned. i will be considering what i need to plant for next year to have blooms at this time of the year. Just let me plop myself down in one of your comfy garden chairs...I am going to be here for awhile....The salvia always captures my attention, but I am with you...the Dragon Wing Begonia is really good looking. Am I ever glad you invited me over to see your December blooms. It is warm and perfectly delightful in your garden...filled with happy plants and critters! I can't put it off any longer, must go home! It's cold, gray and raining...typical winter weather, but I loved the break. Meems, you're lucky to have that Purple Queen! Is it common...I wish it were here! Gorgeous colours of the foliage and flowers. You do have a lot of bloomers - lucky you! I love your purple queen. I have had some of this during summer for several years. It never has the opportunity to grow so large here. When I bring it in during winter it dies back so that I stopeed bringing it in. It takes so long to recover during summer it isn't worth the effort. I just purchase one every year. You have so many blooms that make me think of summer. It will be a long time before I can get any of these growing again. Connie, I like that... royal beauty. Thank you. MMD: Thank you. It was the easiest GBBD post I've ever done actually. Taking the photos in a hurry might be a good method for me to try more often. :-) So sorry to hear your weather is freezing you out so early in the season. You are going to be so ready for spring! Kanak, thank you. And to think I take it for granted because it is so consistent. I'm thinking everyone has purple queen... so why feature it. The blooming flowers do make it sparkle more than usual. And those little blooms were all faded away today. I caught it just at the right time. Marmee, You might be onto something. I wonder if it is possible. Have a look around and see what has survived in other gardens... that will give you a good start. Gail, You with your tea and me with my coffee... Gosh, I almost hate to say it but today was one of the picture perfect days when a nice long visit in the garden chairs was absolutely in order. I am so pleased with the dragon wing begonia. Right this minute it is offering such brilliantly colored foliage and blooming too. So many good things about it and before last year I never knew it would grow right in the ground. Do come for a break anytime you are weary from the winter TN weather. Katarina, Purple Queen does seem common to me... maybe because it grows so easily in this area. I can pinch off a piece of it, stick it in the soil and it will take root. Thank you, the foliage colors do add to garden this time of year. Lisa, The Purple Queen definitely likes plenty of sunshine. I can see why it wouldn't do well overwintering indoors. Purchasing each spring is probably best. They are fairly fast growers - lucky for you. I'm glad you found the time to post for bloom day, because you have blooms! That purple heart is huge! I enjoyed looking at your lovely blooms on this snowy day in Nebraska. We're supposed to have freezing rain or something that will make it very slick tomorrow. I wish they'd call off school. I think I have that purple plant that blooms pink in a pot in my house. It really doesn't like being in here, and is starting to get leggy. I think I need to cut it back. Yours is lovely! To garden year round. Sigh. I always say you can just spit and things will grow in Florida ! Your garden is lovely as always and thanks for sharing it for us snow birds.